Part 4 - So .... what's the web traffic development roadblock? We've already established there's a $20 billion growth opportunity in the office products industry, and that there's already an experienced and knowledgeable sales organization in place that could potentially take advantage. Everyone's aware massive changes are taking place to the way business is being conducted and, at the core of these changes is the internet and our "new" digital environment. It should be clear that a set of digital skills and appropriate strategy is necessary to operate successfully within this new environment. However, many of the independent resellers that make up this sales organization lack the digital skills required to take advantage of the opportunity. Many are experiencing declining sales and profitability, reducing options to pay others for the skills they lack. Furthermore, in lacking these skills it makes it difficult to assess whether others, that claim to have the required skills for managing business transformation services, are really qualified. The results of this dilemma are numerous, and mostly failed, "go-it-alone" efforts from the majority of the reseller community. A business transformation solution is never going to be easy and it's never going to happen overnight. It's hard work, it takes time and a host of new skills are required. The successful resellers in the office products industry (as we saw, consisting mostly of a small group of large organizations) have all deployed strategies that contain these elements. They've spent millions of dollars and 15+ years getting to the position they currently enjoy. Small to medium size resellers do not have the resources to independently replicate the efforts and accomplishments of the large office products resellers. In order to demonstrate the scale of this issue, let's put ourselves in the shoes of a small to medium size reseller that realizes it must digitize its business and starts looking into the requirements. New website specifically developed for the industry and for content marketing must be developed. Business Plan to establish goals and key performance indicators necessary for measuring performance against plan. Information Technology enhancements - a successful digital strategy requires the use and understanding of large amounts of data. Content strategy - an understanding of a content strategy must be developed. Attempting a digital strategy and development of relevant content without a plan will surely fail. Social Media platform setup - a minimum of four platforms will be necessary - LinkedIn, Facebook, Google+ and Twitter. Each of these platforms must be optimized for them to have any value. Social Audience Building - how to build and engage with a relevant audience is imperative. Optimizing each of the platforms but not understanding how to build and engage with an audience is not going to help. Digital Marketing - a solid understanding of digital marketing techniques and strategy must be developed. The scope of the field is vast and researching and developing a viable strategy will consume a lot of time. Developing relevant and useful content - a business either has to generate its own content or outsource. No one knows the business better than the owner and outsourcing to a less knowledgeable agency involves a significant risk that the content will not be useful or respected by the target audience. Email Marketing - one of the most important components of a digital strategy as this will be the primary platform for communicating with prospects and developing leads. Significant time will need to be invested in order to understand modern techniques and developing successful campaigns. Leveraging social media platforms - we saw in part-three of this series of articles just how valuable the social media platforms are to successful enterprises. Publishing and promoting social media content is a vital component of a modern digital strategy. Significant time will be required to develop sufficient understanding and then to maintain efforts on an ongoing basis. Fulfilling these requirements will require an upfront investment in the region of $45,000 and ongoing monthly expenses of nearly $8,000. That's a $140,000 expense in the first year alone, followed by recurring annual expenses of $100,000. This is a cost prohibitive investment for a small to medium size business and, even for an office products reseller that has the skills to understand the concepts and risks, it's not a viable path to take. 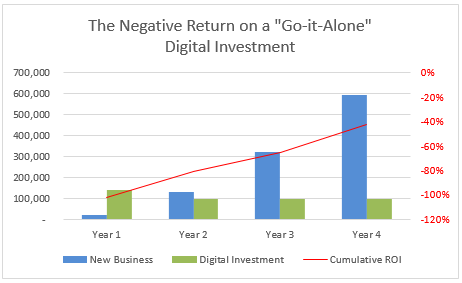 The chart illustrates the fundamental reason for the failure of small to medium size resellers to execute "go-it-alone" digital transformation initiatives. This large upfront investment also assumes a business owner starts out with a pretty good idea of what he's going to attempt and that blind alleys and drastic course adjustments are not required as the strategy is executed. The reality however, is that most likely it will prove difficult to stay inside the budget or the planned time frame. The chart shown above was built assuming an existing business, with around $600,000 in annual revenue, executes a successful digital strategy generating new business of $600,000 in year-4. Assuming a 56% product cost and 25% operating expenses, it means a 4-year cumulative investment of $440,000 will generate around $270,000 of cumulative net income - representing a negative return on investment of minus 42% over the four-year period! So, for a business with annual revenues of less than $1.0MM it's difficult to see how a "go-it-alone" digital strategy justifies. Not only is there likely to be no return on the investment but the risk of failure is far too high. I've decided to expand this topic to a five or even six-part series to keep the content and explanations more manageable. Please keep a look-out for the next part in the series to be published within the next two weeks where I'll introduce potential solutions to the dilemma for small business that I've explained here. In the meantime please click on the link below to download a copy of a recent industry presentation closely related to the topic I'm covering.